Ladies and Gentlemen and all you you other fantastic persons without proper “Tea Service”!!! We give to you a Project that is 3 long years in the making. Not because it took us that long to create the songs mind you, but because it took that long to finalize a crew to weather the storm. DEVM is now on the Crusade to provide content to support our expanding adventures into Musical Entertainment. The shows are getting more interactive, with contraptions added every time a venues can accommodate. Live light shows, Video projections, and most important of all — “trials” and “competitions”. YES!! for the connoisseur and average show goer we will put you to the test to make attempts at grabbing the proverbial Brass Ring… Yes my friends we mean PRIZES!!! We want to take this time to Thank all that have contributed to spurring us on from our initial introduction unto the SteamPunk Scene. If it was not for the love and support of many, we would most likely have not been able to obtain the current level of artistry of which we are proudly presenting to you in our New Album “ALL STRUNG UP” now available in our online store. 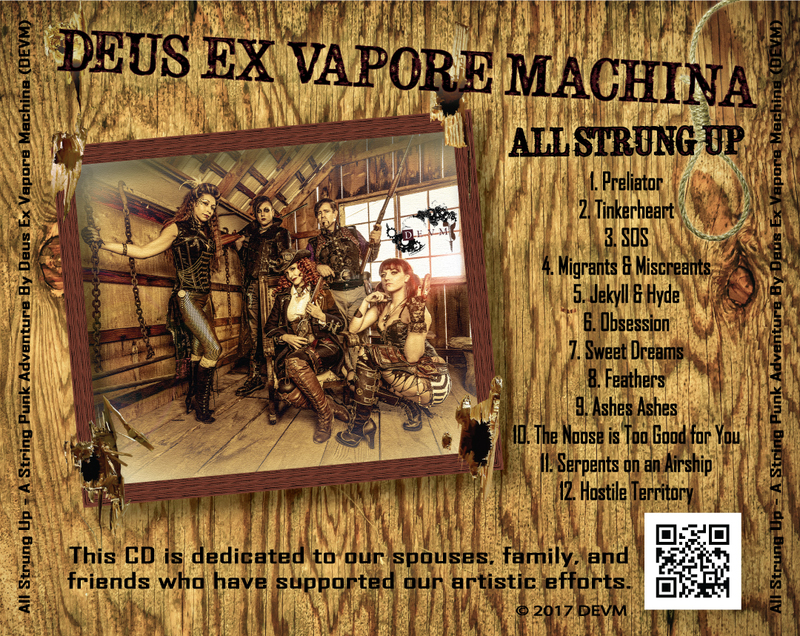 As a contributor to the Steampunk Music scene– we hope that many of your will help us get the word out about our very existence! (this still seems to be a challenge at times in new regions that we have not yet visited or performed at) With your help, DEVM will be able to bring our Stories and Tales of adventure to an event or concert near you soon! We can not do this without you!! and that is why you are priority number one to us. Fly high and Aim Low my compatriots! !